The Lily Pond by Annika Thor. A Steiner Sisters Novel. Review: The life of a Jewish refugee child can be hard, and the difficulties the refugees face are beautifully illustrated in The Lily Pond, by Annika Thor. 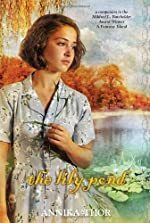 The Lily Pond is the companion novel to A Faraway Island and is the second book of a quartet series about the Stiener sisters. The main character of this particular book is a Jewish girl named Stephie Stiener. Stephie is a 13 year old Jewish girl whose life is in a never-ending flux. Recently, she has moved in with her foster parents in Sweden, and Sven, Stephie's crush, is living in the same house with her. Her new school is in Goteberg, a town in the mainland. As time goes on, it seems that Stephie is even falling in love with Sven! Like all teenagers, she has to face challenges every day. Her parents are in Vienna, where the Nazis are, and she constantly worries about them. Also, she experiences a true friendship and hopes that Sven will like her back. I think that The Lily Pond is a touching story. I personally like to read about the Jewish children during that time period. The author wrote it in 3rd person, which is a different point of view than I generally enjoy. 3rd person didn't allow me to go into the character's thoughts. However, it shows more action and can transfer to a different character in the novel. I thought that was very interesting. Also, I liked how Stephie is very good friends with Sven. This made it easier for her to have a good relationship with Sven. Because the setting is in Sweden, it allowed me to be able to travel to another country without actually being there. I would recommend this book for anybody who loves a story about friendship, a little romance, and historical fiction. The Stiener Sisters series has also been in an eight-part miniseries in Sweden. Also, the series has been translated into hundreds of languages. We would like to thank Random House for providing a copy of The Lily Pond for this review. Have you read The Lily Pond? How would you rate it?